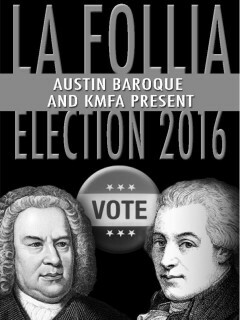 As election time draws ever nearer, La Follia Austin Baroque provides a scene for classical comic relief in its election year spoof, Election 2016: Bach vs. Mozart with KMFA 89.5. La Follia’s beautiful, authentically performed music is presented in a light and cheerful concert, complete with audience participation as they vote for their favorite composers to be the next President and Vice-President of early Classical Music. Classical 89.5 KMFA announcers will host this momentous event.